The quality of the dress is exceptional. The service is excellent. Shipping on time. Received the dress earlier than expected. Was worried about buying a dress on line, but gave them the measurements and the dress fit great. Dress is well made and my daughter loves it. Plan to order next year's prom dress from Hebeos. I was very happy with this dress!! I ordered it in color as the pic as the customer service guided. Really beautiful dress and really high quality fabric. I love it so much. Good quality, nice dress. I will come again. 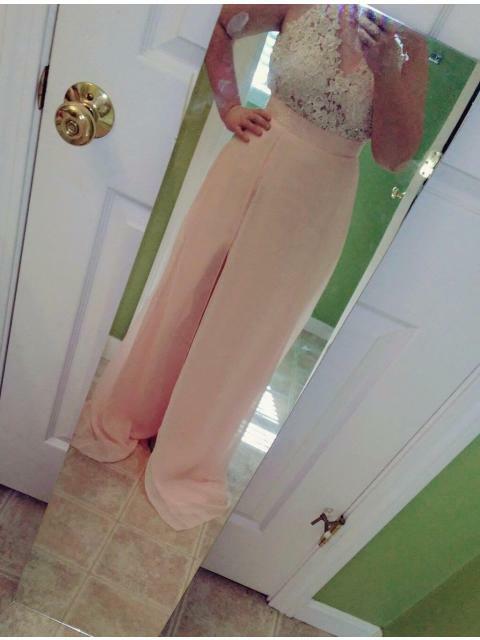 I purchased this dress for my bridesmaid's dresses I only order them about 4 weeks ago and they are all already here and and I'm extremely happy with the quality and htey way they look! I am getting married in Cancun in January 2011 and was looking for a dress that was both elegant and could also be worn for a destination wedding. hi I would just like to know if the colour of the dress the model in the photo is wearing is white?? 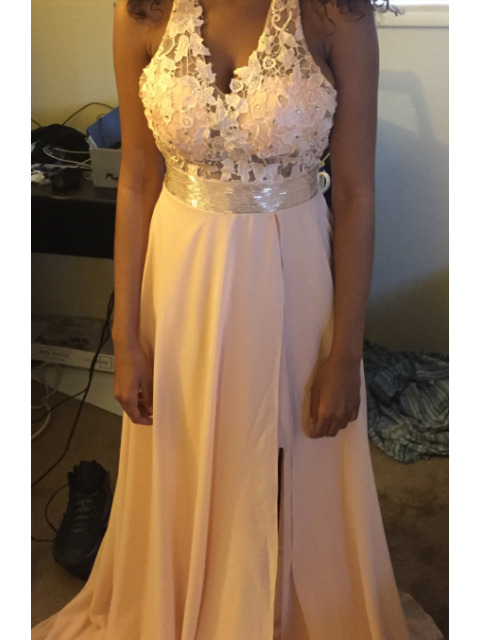 My daughter ordered this dress in different colors other than the models are wearing, It turned out beautiful! It is exactly what she wanted. Worth the wait! This dress makes the girls look awesome and legs look flawless!the detail on the top is out there yet elegeant. love it! I am still nervously awaiting my order. I read in other reviews that the flower is lower and smaller and that the material of the train is different. I am looking forward to receiving what I see pictured here. 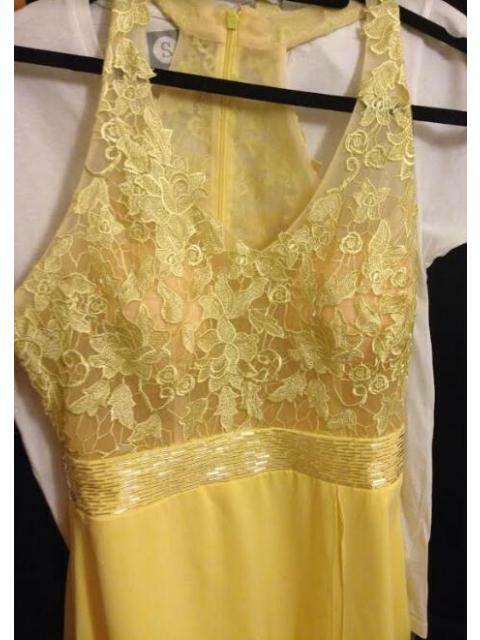 The quality of the dress in the picture looks higher quality than the pictures from the reviews. Even the train looks alot fuller and more beautiful on the model. Who do I speak with to ensure that my order is in the same quality as the model dress pictured? Also...Is the model wearing a sort of petti coat underneath the dress? I have contacted customer service reps via your store chat...but just receive a answer 'please take a chance'...sounds good but not quite enough info for a bride. Once I receive my item I will provide a review here as well as my own review blog to note my experiences fairly...whether good or bad. Maravilhoso amei o vestido...de uma verdadeira pricesa!! La robe correspond exactement à la photo. Les mesures et la coupe sont parfaites. Mieux que je ne l'espérais! Livraison plus qu'express: partie vendredi 22:30 arrivée lundi 12h00. La TVA et les frais DHL se sont élevés à 24€ pour 71€. I have just received my dress and tried it on. It is absolutely beautiful. Exactly like it is on the website. Very nice dress! I had to cut the trail because it was quite long and even if it was very elegant it was not adequate to an usual christening party. The color was very nice ( burgundy) but be aware that the dress may not be suitable for summer because it has a lot of layers. This is the first time that I have ordered an item from this site. The dress that I bought is exactly what was expected. I am extremely happy with the dress and I have ordered more items. The service and mail delivery were excellent. Thanks. SABES EN ESPAÑA LA TALLA 12 Y LA 14 A QUE TALLAS EQUIVALEN EN ESPAÑA??? TE LO PEDISTE PERSONALIZADO O DE LAS TABLAS DE MEDIDAS QUE HAY?????? Today I received my cute dress, really beautiful when I put it on. The detailing on the straps were so beautiful and the sewing was excellent. The Customer service is really good and have given me a lot of useful suggestions,thanks. This is a beautifully and quality made dress.Delivery was fast too.I would highly recommend this company. The dress has arrived quickly. Even tho waiting for the dress to be made felt like forever lol it took about 4 weeks. And my beautiful dress arrived 3 days later. I'm so in love with dress. I can't wait to wear it! The dress is exactly what you see in the pictures. I am so impressed with this dress!! The overall make, especially the stitching is so professional. 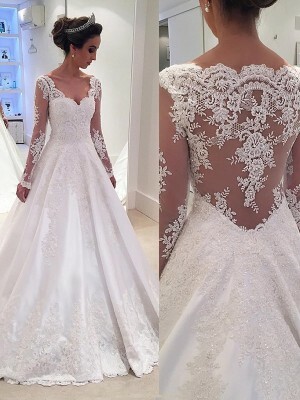 The dress fits me perfectly and the flower detail on the front bodice is exactly like the image. I can not fault it! I am very satisfied.I always place my orders at hebeos and never had any problems with them. They are pretty fast processing orders, and they ship exactly what you order.I will continue purchasing from them! They are 100% recommended.Thanks hebeos! You are the best online shop! The level of service and communication from this store is superb!I am very happy with the dress-market, the quality is great and it fits me really well.I highly recommend these guys! just wondering can i get this in a aqua with a silver bow/belt?? Заказывала платье по индивидуальным меркам, белого цвета. Качество понравилось - швы ровные, аккуратные, в целом выглядит достойно. Вышивку на талии, конечно, отпорю (на мой взгляд дешевит и простит чрезвычайно!). С размерами, видимо, сама промахнулась надо было попросить кого-нибудь, чтобы грудь померили (платье довольно свободно в спине), а на талии еле сомкнулось, но тут не беда, минус сантиметр и можно будет дышать ))) Покупка порадовала, срок доставки с индивидуальным пошивом составил месяц. Thank you so much for the lovely dress. It fits perfectly and arrived so fast! all i want to say is ..the red one is amazing! i just cant believe it, everyone said i am bright and pretty! Highly suggest this dress! A wonderful shopping experience. The website is nicely laid out. The communication was great.Great prices. Great selection. I am very pleased.Well satisfied with the overall experience, would highly recommend. This dress looks perfect for my Bridesmaids. I was looking to get it in Lilac but the Lavender looks more along the lines of Lilac to me! lol! Excellent job... quick answers... and i love my dress.. is amazing... dont be scared ...it works just fine!!! I ordered this dress for my wedding in champagne with burgandy sash. Boa Noite, Gostaria de saber se tem a cor rosa perola e o valor de frete para 24040-000. This dress is going to beautiful at my wedding. The beading and detailing are AWESOME! I was so surprised by the high quality of work. The dress fit perfectly. I received so many compliments. Can't wait to make my next purchase.